1 – a smashed bird…yet immaculately preserved. it looked like a prop. 2 – an old pop-top can of beer. it was well crushed but i did stop to look to see if it was worth taking with. 3 – a very nice bungee cord. 4 – a man sleeping with his bike and a couple of full plastic sacks on east end of the pedestrian bridge across the kansas river. 5 – a rock. a rock i’ve seen in the same spot every day for the past couple of weeks. i don’t know how it manages not to get run over or washed away. impressive, that rock. genius rob and the effervescent katy are having a housewarming party. i’mma finish cleaning our garage. casiotone for the painfully alone playing sun. night at the bottleneck. fingers crossed that we make it out. hoping to post long overdue photos of ro-dog. I found a bungee cord on one of my group rides. It’s mine now. Hope you kept the one you saw. You need bungees for things like Mexican carry-out on your bike. Sounds like you have a hell of a weekend lined up. I’m gonna kick it with some KC blog pals tomorrow night at the Lenexa midnight ride. i’ve been wanting to do that midnight ride for 4 years now – but somehow i always forget the date and end up making other plans. Thanks. It gets me around. A lot. 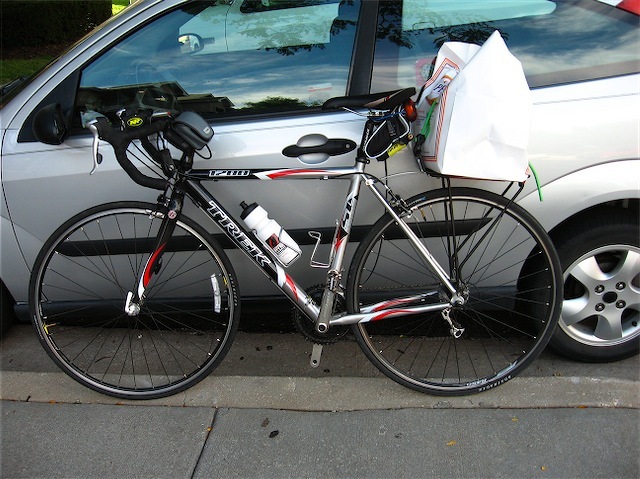 I put more miles on this bike than the car it’s leaning against these days. On the Lenexa ride: I’ll get lots of pics. There’s always next year.